I ride with him often. He's not trolling at all. Absolutely rides in these every time. Probably seems batshit crazy to most of you, but the BEST shoe I have ridden in are Clark's business shoes. @lidphones that's awesome. I am about the same weight. For now I shall continue to play the waiting game. Thanks. Cheers. Not 🦇 💩 crazy at all... I have done a few miles in my Ecco shoes and they stick really well. 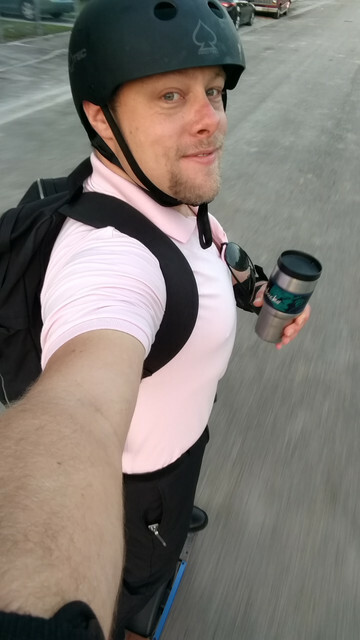 @ow-miami @LidPhones would love to see a pic of you guys in your business attire riding the OW- now that's taking care of business! @ow-miami @LidPhones I bet these are shoes feel the best due to their elevated heel and probably because of their cushy insoles. I tried using skateboard shoes when i first started riding the OW but I found the larger the heel the more connected to the board I felt. Obviously this is speaking specifically to heels on mens shoes not large women's shoes. I have not had any luck uploading pictures or videos to this forum, but if you follow the links in my signature you can see some videos of me riding in a suit and even one with me in a suit with my dog. Someone in the FB Group had a co-worker provided video of him cruising through the office in a full suit.... and the video was set to Riding Dirty.